Objectives: To observe the prevalence of lumbar intervertebral disc degeneration in elite athletes as compared with published literature of changes seen in non-athletes—that is, normal population. Methods: The lumbar spines of 31 Olympic athletes who presented to the Olympic Polyclinic with low back pain and/or sciatica were examined using magnetic resonance imaging. Three criteria were looked at: (a) the loss of disc signal intensity; (b) the loss of disc height; (c) the presence of disc displacement. The results were then recorded and correlated with the lumbar levels. Results: The disc signal intensity was progressively reduced the more caudal the disc space. It was most common at the L5/S1 level, and, of the abnormal group, 36% (n = 11) showed the most degenerative change. Disc height reduction was also found to be most common at the L5/S1 level. However, the most common height reduction was only mild. A similar trend of increased prevalence of disc herniation was noted with more caudal levels. At the L5/S1 level, 58% were found to have an element of disc displacement, most of which were disc bulges. Compared with changes seen in the normal population (non-athletes) as described in the literature, disc degeneration defined by the above criteria was found to be significantly more severe in these Olympic athletes. Conclusions: Although the study was limited, the results suggest that elite athletes have a greater prevalence and greater degree of lumbar disc degeneration than the normal population. A more detailed follow up study should be considered to investigate which particular training activities have the most impact on the lumbar spine, and how to modify training methods so as to avoid the long term sequelae of degenerative disc disease of the lumbar spine. During the 2000 Summer Olympics in Sydney, MRI scans of the lumbar spine were performed on athletes who presented to the Olympic Polyclinic with low back pain (including sciatica). Consent was obtained with the understanding that the images were to be used in a research study. A series of lumbar spine images from 31 elite athletes was obtained. The aim of this project was to compare the prevalence of lumbar intervertebral disc degeneration in elite athletes with changes seen in non-athletes (normal population) as described in the literature. During a four week period (two weeks before and the two week duration of the Sydney Games), the lumbar spines of 31 athletes were imaged. The athletes ranged in age from 19 to 46 years, and represented 20 different countries. Twenty one were aged 20–30, seven were in the 30 plus age group, and two were under 20. One athlete was of unknown age. A multitude of sports was represented, but the largest subgroup was from track and field (n = 12). Other sports represented were volleyball (n = 2), tennis (n = 2), and one each from cycling, rowing, softball, gymnastics, judo, boxing, handball, equestrian, kayaking, table tennis, and shooting. Four athletes did not identify their sport. The whole group comprised 17 men and 14 women. All the athletes had presented to the Olympic Polyclinic with complaints of lower back pain and/or sciatica during the period of the Olympic Games. No other information about them was given to the researchers involved in the study. It was not known if they had had a previous back injury or a history of back pain. Disc displacement was described as normal, bulging, or prolapsed. In the context of this study, a prolapsed disc was defined as one that protruded beyond the vertebral body margin but contained within an intact annulus.15 No attempts were made to be more specific about disc displacement because we were limited by having only the central sagittal MR images. We were able to evaluate a mean of 7.6 discs in each spine, ranging from 6–11. In all cases, the intervertebral discs from L1/2 and L5/S1 were well identified. The films were all mixed and evaluated independently by three examiners, a neuroradiologist, a fellow in radiology, and a radiology registrar. In the case of any discrepancy in interpretation, a consensus was reached after discussion among the three examiners. Signs of reduced signal intensity were most common in the L5/S1 discs. Only 12 (38%) were found to be normal (fig 1). 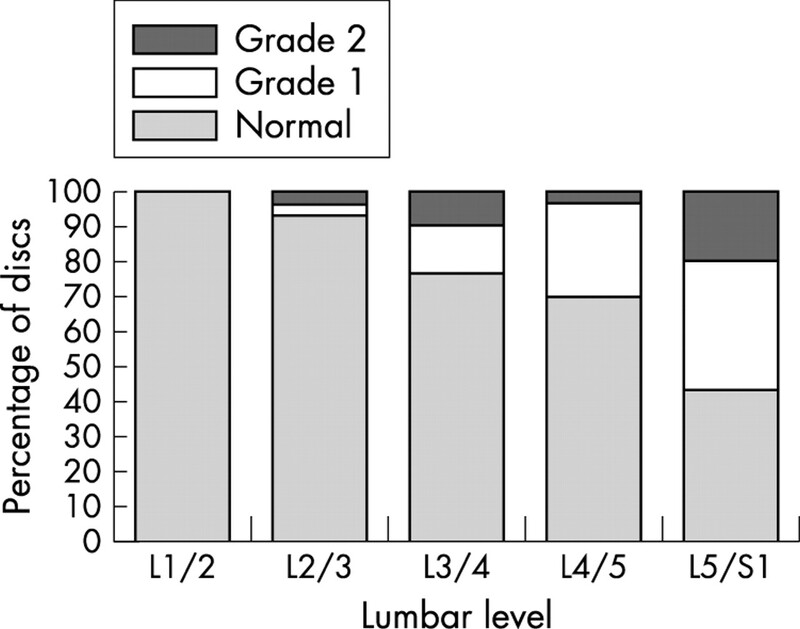 Of the abnormal group, the largest proportion (n = 11; 36%) of disc degeneration at this level was grade 3. Signal intensity of lumbar discs. Grade 1, mildly reduced; grade 2, moderately reduced; grade 3, severely reduced. Normal signal intensity was seen at the L1/2 and L2/3 disc levels in 25 of 31 athletes (81%). The more caudal the disc space, the higher the proportion of abnormal discs. 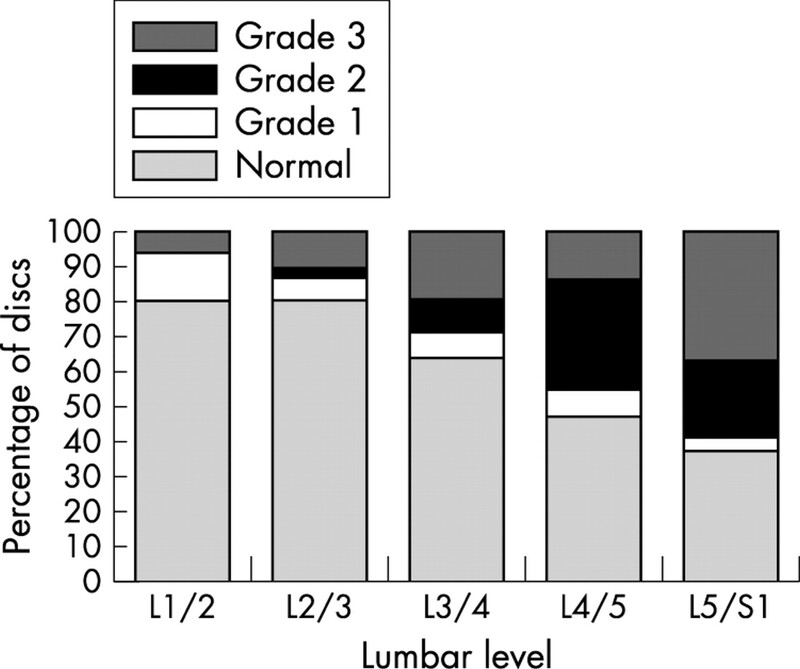 Excluding the L1/2 level, all grades of degenerative changes were present at all levels. Interestingly, the most common type of degeneration found at all levels (except L1/2 and L4/5) was grade 3 (see example in fig 2). In the largest subgroup of athletes (track and field), nine of 60 discs imaged (15%) showed grade 3 degenerative changes, and eight (13%) had grade 2 degenerative changes. Only four athletes (13%) had normal disc signal intensities in all of their lumbar discs. Magnetic resonance image of the lumbar spine of a 35 year old softball player with grade 1 signal intensity at L2/3, and grade 3 signal intensity and grade 2 disc height at L3/4. As expected, reduced disc height was more common as we descended to the L5/S1 level. At the L1/2 level, all discs were found to be of normal height (fig 3). In contrast with our findings of signal intensity, the most common height reduction found was only mild or grade 1 in classification (see example in fig 4), even at the L5/S1 level. Most athletes only had disc height reduction at a single level (68%). Six athletes (19%) had normal disc heights at all levels. Lumbar disc height. Grade 1, mildly reduced; grade 2, grossly reduced. Magnetic resonance image of the lumbar spine of a 27 year old tennis player with grade 2 signal intensity at L3/4, L4/5, and L5/S1, grade 1 disc height at L3/4, and disc bulge at L5/S1. The total prevalence of disc displacement at one or more levels was 58% (18 out of 31). At L1/2 and L2/3 levels, there was no evidence of any disc displacement. 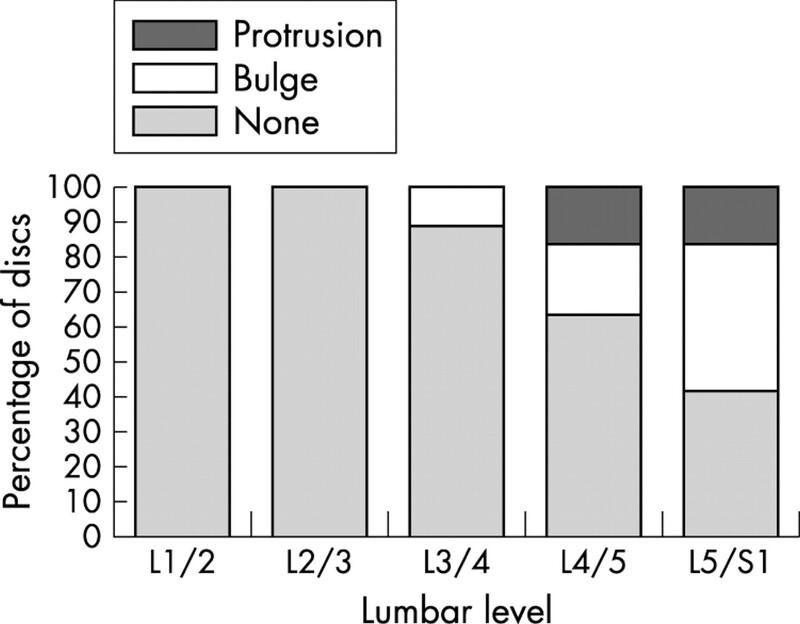 Only disc bulges were present at L3/4 (see example in fig 4), representing 10% of the group (3 of 31). At the L5/S1 level (fig 5), 18 of 31 discs (58%) were found to have a degree of disc displacement, most of which were disc bulges. Radiological abnormalities in the lumbar spines of elite athletes are well described. Numerous studies have shown that there is a significant difference in prevalence of these abnormalities between athletes and non-athletes.1,2,16–18 Sward et al2 found that disc degeneration was more common in athletes (75%) than non-athletes (31%). Degeneration of the intervertebral disc begins early in life and is partly a consequence of aging. Powell et al7 observed that more than one third of normal healthy subjects aged 21–30 years had degenerate discs. Although the actual cause is not known, many factors (autoimmune, genetic, reabsorption, and biomechanical) have been implicated in accelerating the process. The volume of the intervertebral disc tissue decreases with degeneration,12 and it has been shown that failure of the human lumbar intervertebral discs occurs most often in the part of the spine that is subjected to the heaviest mechanical stress.19–21 The results of several studies have shown that the level of physical activity affects disc height.22–24 However, Luoma et al25 have questioned the validity of disc height as an indicator of early disc degeneration. In this study, the proportion of discs with reduced height gradually increased in a caudal direction, with the greatest prevalence at the L5/S1 level. Similarly, signal intensity of the lumbar intervertebral discs becomes progressively reduced caudally. This trend is similar to the results obtained by DeCandido et al.15 In our study, at the L1/2 level, 81% of discs have normal signal intensity (compared with 78% found by DeCandido et al), which then progressively decreases to 38% (40% found by DeCandido et al) at the L5/S1 level. However, the most striking difference between our study and that of DeCandido et al is that, of the cases with degenerative changes in our study, a significant proportion are more severely affected—that is, grade 3. This is most noticeable at the L5/S1 level, where, of the 19 degenerate discs, 11 are categorised as grade 3 (58%). It must be asked if the great physical demands placed on athletes in training contribute to the more severe degenerative spinal changes. This is supported by the 2001 study of Luoma et al,25 which showed a decreasing trend of relative signal intensity from sedentary office workers to labourers. The prevalence of disc displacement at one or more levels, grouped in this study as either a disc bulge or disc protrusion, is 58%. Again, the prevalence increases progressively caudally, with the greatest numbers at the L5/S1 level. Disc bulges are more common than protrusions in this study, with a prevalence of 42% compared with 16%. This is actually lower than found by Stadnik et al,26 who showed an all age prevalence of 81% and 33% respectively. However, if the under 30 age group is considered, the figures fall to 56% and 11% respectively. No firm conclusions could be drawn about disc displacement because of the limits of having only the central sagittal MR images. A more accurate and useful figure could possibly be reached with access to the axial scans. The other limitations of this study include a small cohort of subjects and the lack of a control group. Tests of statistical significance were therefore not performed, and none of the results can be interpreted meaningfully. It would have been useful if we had access to specific information about the athletes’ symptoms, which would have allowed a clinical correlation to be made with the images studied. As no conclusive evidence has been reported in the literature to suggest that anatomic anomalies found on MRI relate directly to the symptoms of lower back pain,27,28 clinical information is essential for determining the importance of any abnormality found on MR images. Borenstein et al28 suggest that the findings on MRI scans are not predictive of the development or duration of low back pain. However, the higher incidence and greater degree of disc degeneration in elite athletes found in this study warrants further investigation. Are athletes aware that participation in sport at the elite level may lead to accelerated degeneration of the spine and its long term sequelae? Other things to consider are which particular physical activities have the most impact on the lumbar spine and what training methods can be devised that minimise disc degeneration. The age at which athletes should begin intensive training is another important consideration. A follow up study should include a symptomatic and asymptomatic group of athletes, as well as a control group of symptomatic and asymptomatic non-athletes—that is, normal population. The results of this study may well be important in altering the mindset of coaches and athletes, as well as causing a change in the methods of training at the elite levels of sport. Sward L, Hellstrom M, Jacobsson BO, et al. Back pain and radiologic changes in the thoraco-lumbar spine of athletes. Spine 1990;15:124–9. Sward L, Hellstrom M, Jacobsson BO, et al. Disc degeneration and associated abnormalities of the spine in elite gymnasts: a magnetic resonance imaging study. Spine 1991;16:437–43. Ferguson RJ, McMaster JH, Stanitski CL. Low back pain in college football linesmen. J Sports Med1974;2:63–9. Jackson DW, Wiltse LL, Cirincione RJ. Spondylosis in the female gymnast. Clin Orthop1976;117:68–73. Semon RL, Spengler D. Significance of lumbar spondylosis in college football players. Spine1981;6:172–4. Szot Z, Boron Z, Galaj Z. Overloading changes in the motor system occurring in elite gymnasts. Int J Sports Med1985;6:36–40. Powell MC, Wilson M, Szypryt P, et al. Prevalence of lumbar disc degeneration observed by magnetic resonance in symptomless women. Lancet1986;2:1366–7. Boden SD, Davis DO, Dina TS, et al. Abnormal magnetic-resonance scans of the lumbar spine in asymptomatic subjects. J Bone Joint Surgery [Am]1990;72:403–8. Schneiderman G, Flannigan B, Kingston S, et al. Magnetic resonance imaging in the diagnosis of disc degeneration. Spine 1987;12:276–81. Jenkins JPR, Hickey DS, Zhu XP, et al. MR imaging of the intervertebral disc: a quantitative study. Br J Radiol 1985;58:705–9. Modic MT, Pavlicek W, Weinstein MA, et al. Magnetic resonance imaging of intervertebral disk disease. Radiology1984;152:103–11. Modic MT, Masaryk TJ, Ross JS, et al. Imaging of degenerative disk disease. Radiology 1988;168:177–86. Gibson MJ, Buckley J Mulholland RC, et al. The changes in the intervertebral disc after chemonucleolysis demonstrated by magnetic resonance imaging. J Bone Joint Surg [Br] 1986;68:719–23. Masaryk TJ, Boumhrey F, Modic MT, et al. Effects of chemonucleolysis demonstrated by MR imaging. J Comput Assist Tomogr 1986;10:917–23. DeCandido P, Reinig JW, Dwyer AJ, et al. Magnetic resonance assessment of the distribution of lumbar spine disc degenerative changes. 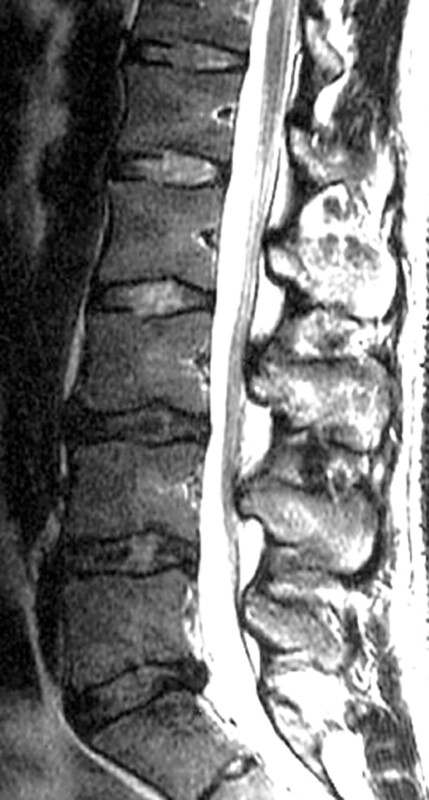 J Spinal Disord 1988;1:9–15. Hellstrom M, Jacobsson B, Sward L, et al. Radiologic abnormalities of the thoracolumbar spine in athletes. Acta Radiol 1990;31:127–32. Rachbauer F, Sterzinger W, Eibl G. Radiographic abnormalities in the thoracolumbar spine of young elite skiers. Am J Sports Med2001;29:446–9. Lundin O, Hellstrom M, Nilsson I, et al. Back pain and radiological changes in the thoracolumbar spine of athletes. A long term follow-up. Scand J Med Sci Sports 2001;11:103–9. Brown T, Hansen RJ, Yorra AJ. Some mechanical tests on the lumbosacral spine with particular reference to the intervertebral discs: a prelim report. J Bone Joint Surg1957;39:1135–64. Evans FG, Lissner HR. Strength of intervertebral discs [abstract]. J Bone Joint Surg1954;36:185. Nachemson A. The load on lumbar disks in different positions of the body. Clin Orthop1966;45:107–22. Evans W, Jobe W, Seibert C. A cross-sectional prevalence study of lumbar disc degeneration in a working population. Spine1989;14:60–4. Hupli M, Heinonen R, Vanharanta H. Height changes among chronic low back pain patients during intense physical exercise. Scand J Med Sci Sports1997;7:32–7. Porter RW. Does hard work prevent disc protrusion? Clin Biomech1987;2:196–8. Luoma K, Vehmas T, Riihimaki H, et al. Disc height and signal intensity of the nucleus pulposus on magnetic resonance imaging as indicators of lumbar disc degeneration. Spine 2001;26:680–6. Stadnik TW, Lee RR, Coen HL, et al. Annular teas and disk herniation: prevalence and contrast enhancement on MR images in the absence of low back pain or sciatica. Neuroradiology 1998;206:49–55. Beattie PF, Meyers SP. Magnetic resonance imaging in low back pain: general principles and clinical issues. Phys Ther1998;78:738–53. Borenstein DG, O’Mara JW Jr, Boden SD, et al. The value of magnetic resonance imaging of the lumbar spine to predict low-back pain in asymptomatic subjects: a seven year follow-up study. J Bone Joint Surg [Am] 2001;83:1306–11.